"Rudy Kraft contacted me in the summer of 1979 about a freelance RuneQuest project he was writing for Judges Guild called 'Adventures Beyond the Pass.' Rudy was exceptionally good at setting up reasonable character stats for RuneQuest characters, but not quite so adept at really making them come alive. I gave life and purpose to the barbarians and humanoids in the place. I remember doing extensive additional writing and mapmaking to flesh out the world. 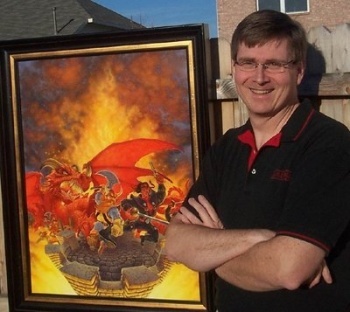 [Chaosium founder] Greg Stafford got wind of our efforts and wanted to see it. We gave him a copy of our unfinished draft and he loved it. He wanted the characters and settings we had fleshed out to be a part of his world of Glorantha, not a generic setting. Becoming part of 'canon' was too tempting an offer to refuse, so we shifted publishers and included Greg as a co-author." Much of the activity in Balazar comes from the tribal fortresses of Trilus, Elkoi and Dykene. ... These are not shining castles covering miles of countryside, nor do they have ivory towers reaching for the sky. In general, they are small and squalid with narrow and mud-choked streets providing perfect wallows for pigs. Which, coincidentally, is one of the primary reasons for the existence of the citadels - the Balazaring kings have a monopoly on domestic pigs. When the late '70s fad in tabletop roleplaying peaked and died, Jaquays helped many designers pass osmotically into computer gaming. In 1980 fellow designer Michael A. Stackpole recommended Jaquays to the game development group at Coleco. At this toy-turned-tech company he worked his way up to Director of Game Design, where he recruited nearly a dozen fellow paper-game designers formerly with TSR, SPI, Victory Games and other tabletop giants to work on arcade games. "In 1982, when I was given the task of putting together the art and design teams for [the game console] ColecoVision, there really weren't such things as videogame designers who weren't programmers. Even the art for most early games was done by programmers. For designers, I relied on my own background and looked for creative people who could analyze what made something fun and then document the living daylights out of it. They needed to be people who wanted to work on games because they really loved games. RPG and wargame designers fit that bill. On the art side, we found (mostly) young artists willing to work on something exciting and new, even if their previous training had done nothing to really prepare them. "The team bonded well, and for a couple years I felt like King Arthur might have felt about his Knights of the Round Table. I had the best people working for me, and we were doing things no one had done before. I like to think that Coleco game development group pioneered the way for today's multi-discipline game studios." Jaquays' project teams ported dozens of coin-op arcade games (Donkey Kong, Frogger, Zaxxon) to the ColecoVision and Intellivision consoles, as well as to standalone "home arcade" tabletop electronic versions. Animated artwork for fluorescent tube displays - ah, those were the days.